To learn how to accurately code in ICD-10, you must practice coding. This is the perfect resource to help you practice coding the most common and most complicated home health scenarios so you can then apply your knowledge to real-life coding cases. To learn how to accurately code in ICD-10, you must practice coding. 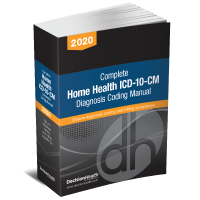 DecisionHealth's Home Health ICD-10-CM Coding Answers, 2019 is the perfect resource to help you practice coding the most common and most complicated home health scenarios so you can then apply your knowledge to real-life coding cases. 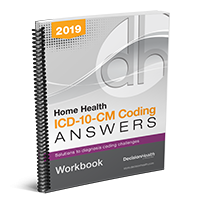 Once you’ve purchased the Answer Book, make sure to get workbooks for all of your coders with the Home Health ICD-10-CM Coding Answers Workbook, 2019 – 5 pack. Practice your coding or teach others about coding by working through 150 ICD-10 coding scenarios that cover home health's most complicated situations, including surgical and trauma wounds as well as complicated wounds, sepsis, multiple diabetic manifestations, lower extremity ulcers, proper assignment of 7th character, injuries, fractures, late effects, and much more! You can code each scenario in the separate workbook, and then look up the answer and rationale behind the coding in the Answers Book. The scenarios are divided into disease sections that match the chapters of your Complete Home Health ICD-10-CM Diagnosis Coding Manual, 2019. Important: You must have the Answers Book in order to use the workbooks.